One stop service company for oilfield instrumentation and control systems, cable assemblies, software and product engineering, computer and network services. 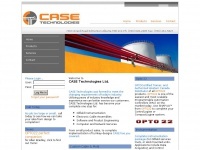 CASE Technologies Ltd is specified as the websites creator. The web server used by Casetechltd.ca is located near the city of Oakville, Canada and is run by Host Papa. 51 other websites are located on this web server. Most of them are provided in the english language. The websites of Casetechltd.ca are served by a Apache server. The markup language of the website is XHTML 1.0 Transitional. Both the inclusion of the website in search engines and follwoing of its hyperlinks is explicitly allowed.